I was quite amused to see “Ferrari” written across the crane arm of this truck. I initially though the truck driver was just advertising for his favorite car! But after a little Googling, I came across the Italian company that exports those cranes. They are called Flli Ferrari and they sell these Ferrari cranes in various sizes. That truck driver could actually claim to drive a Ferrari! Of late there has been a lot of news that the Ministry of Electricity & Water (MEW) was planning to cut off power supply to customers with outstanding amounts. Now they are planning to sue defaulters. Recently, all doors (including the lift doors & passage doors) in my building and the neighboring ones were plastered with disconnection notices from MEW. The notice was a little generic a5 piece of paper stating that we had to pay our bill in 7 days or get disconnected. No mention of the meter number. No mention of the amount due! Now who would want to get disconnected during these days when temperatures cross 50 degrees Celsius? So almost everyone from the building went over to MEW. Seems they sent someone over to plaster notices, but that guy didn’t take the meter readings. So we had to go to the next building where one of their “engineers” would come over and take down the meter readings. And here is the good part, all their “engineers” were demanding a 2KD “tip” for putting their signature along side the reading. Whether you take the reading yourself and bring it to them or you drive them to your building where they take the reading, you still need to pay them a 2KD “bribe” so they sign off on the meter reading so that you can pay your bill so you don’t have to sweat to death in this climate! How considerate of the MEW. 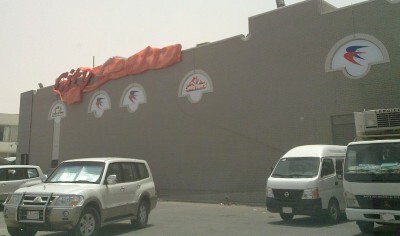 Now 2 KD may not sound like a lot, but when your electricity bill averages 4-5 KD per month, that does sound like a lot. Also, it’s 2KD per meter reading. 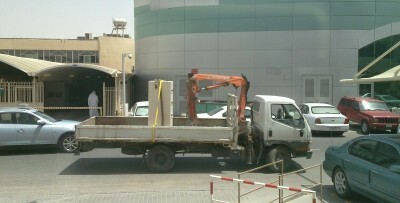 So with an average of 40 meters per building in our area, these “engineers” would make about 80 KD per building. Actually, they would make about 80-160KD per day considering how many buildings are in our area. That’s more than a lot of real engineers make working in the Oil & Gas sector! And all this because they don’t have to deliver electricity bills to your door / meter like every other country does! Anyway, our nice building “haras” (caretaker) was kind enough to assist all the tenants so the whole process went smoothly and we all paid our bills. A good start to the hottest summer ever! 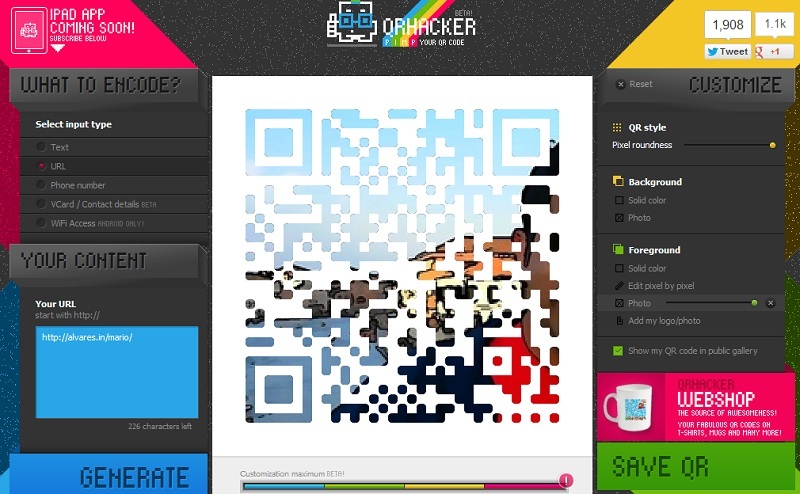 QRhacker is an excellent tool to come up with some funky QR codes. 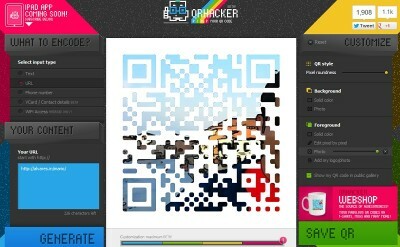 I didn’t think QR codes would work in color! The tool is real simple to use and in less than a minute you have your pimped QR code all ready for use. Give it a go. Print a copy and stick it on your car! Came across this old video of a new car exhibition in Kuwait in the 1980′s. It’s amazing how futuristic a lot of the cars look. It seems like a far better show than most of the more recent ones held here. 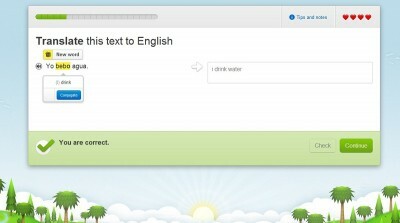 DuoLingo is a neat concept. 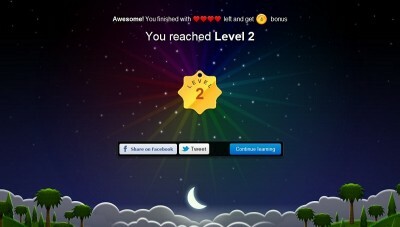 You get to learn a new language for free and participate in translating the web to that language. The application itself seems to be improving constantly with invites being the latest feature. I have a few to give out so send me your email addresses if you want in. I got invited to their private beta last month. 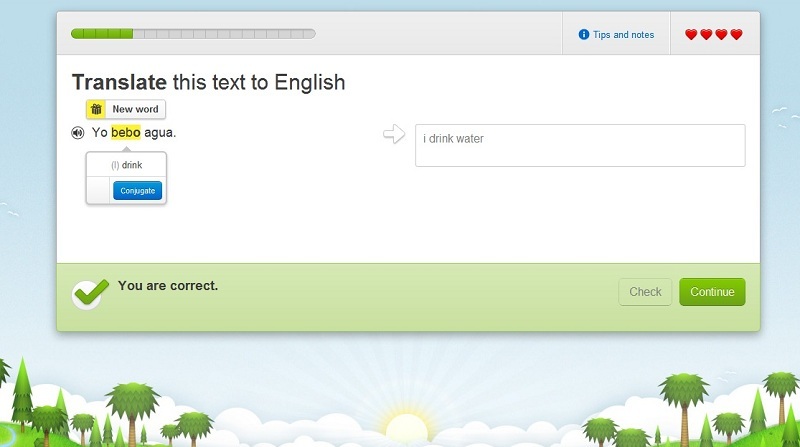 I’ve been trying to learn Spanish and it seems to be going fine. The whole app is browser based and supports speakers so you can hear what sentences sound like as well as a mic so you can talk too (yes, it does analyze your pronunciation). I love the structured course outline and the simplistic UI. Overall it’s a very rewarding learning experience. The crowd-sourced translation of the web bit is also pretty cool. Line by line, you submit your English translation along with hundreds of other users. Then you can view all the translations and rate them. There were some technical pages involving Linux commands that I translated and I think I did a damn good job on those! I’m still learning the basics but it should come in handy when I visit any of the several counties that have a lot of native Spanish speakers! We normally stock our fridge with 1L tubs of ice cream. 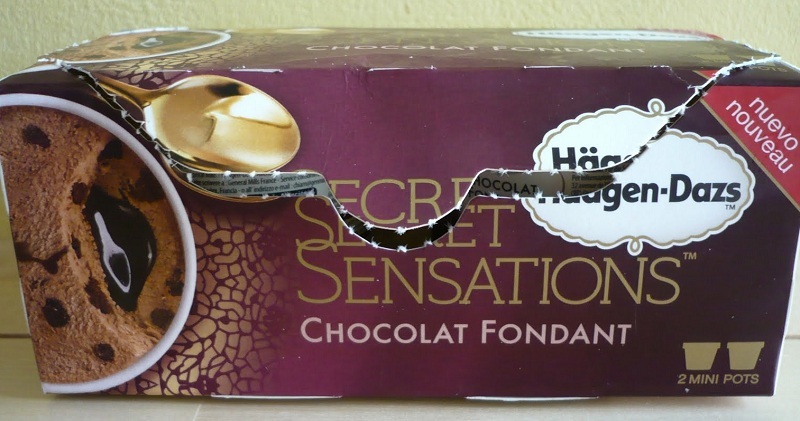 The Hagen Dazs Secret Sections pack would be the only exception. The Chocolat Fondant flavor is probably the best ice cream out there! You gotta leave it standing on the table for like 10 mins after you take it out of the fridge. If your impatient like me and live in the desert, you can leave it out for 5 mins. Then dig in, but gently. 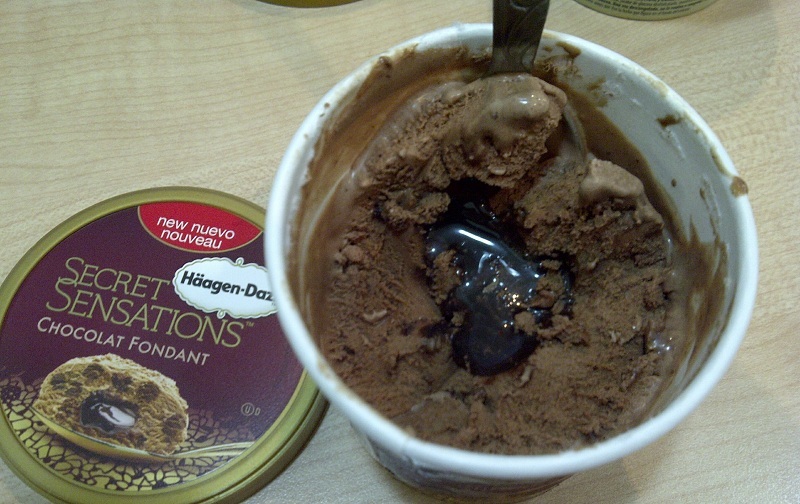 It’s quite a smooth and rich ice cream and the small serving package it comes in is probably a good size for it. There are tiny bits of brownie in the chocolate and a little gooey chocolate sauce in the middle which is the best part. Motion Induced Blindness Causing Accidents? I was reading about Motion Induced Blindness today on the Motorcycle Safety Foundation website. It’s interesting and scary at the same time. Basically, when you drive at high speeds with no distractions (staying focused on the road ahead), you automatically go blind to other objects around you. In some cases, you may not see cars approaching from the sides, in other cases you may not notice the signal turning red. This could account for the huge number of road accidents in Kuwait. Almost everyone drives over 120 km/hr on all the highways. We all drive through mostly desert terrain (brown sandy landscapes or brown buildings) with few distractions (unless your on the Gulf road). And most drivers wear huge sunglasses or head scarfs that block some of the side vision. The solution is simple. Keep swiveling your head every now and then and move your eyes about to break from gazing ahead. 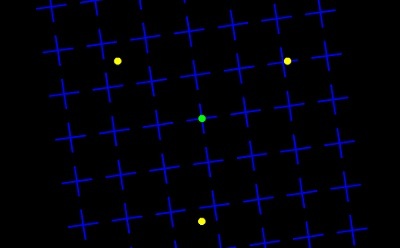 To see how motion induced blindness works, try the demo at this link. Ro and I had a great time this weekend at the Ambassadors of Comedy show. We laughed so hard that at times our stomachs started to hurt! The show was organized very well. 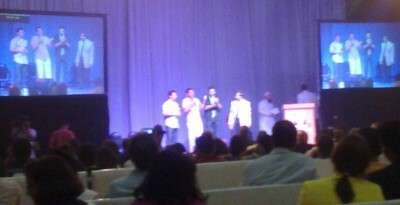 Nitin, Dean & Aaron were great. Nitin hit home with more Middle East material. Both the Americans had a balance of humor between American politics (President Bush of course) and their usual Arab terrorist angle. For most of us, Ashfaq, the emcee was probably the funniest of the lot. The crowds went crazy for him every time he came on stage. Could have either been his shiny silver jacket or that accent he was talking in! Not sure if should be called garbage, but I see a lot of people just throwing away their old furniture near the garbage bins. And what amazes me is how meticulously these workers stack up the old furniture to make max use of the space on the truck. 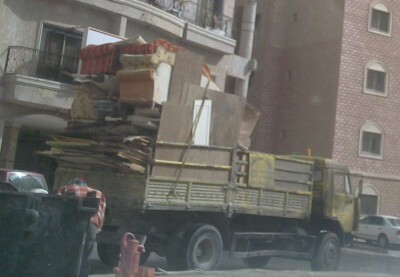 They even break up cupboards & tables to separate the wooden planks and squeeze more into that truck. I bet most of it is recycled and some of it might end up at the Friday market after some re-furbishing.